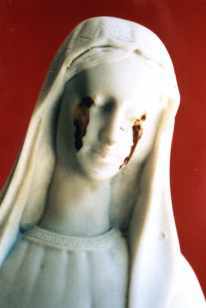 A report of Father Lluís Costa's response to a marble statue of the Madonna crying tears of blood in Mura, Spain. May 1998 - Written by Carmen Fon. The quiet life of the small and secluded village of Mura, 50km north of Barcelona, was shaken when, on 16 March 1998, the local priest Lluís Costa discovered that a 70cm-tall white marble Madonna statue 'looked as if she had been crying tears of blood'. The statue had been brought from Medjugorje and exhibited on a square outside the village church on a pedestal 2.5 meters high. From one corner of each eye drops of blood had poured down her face until it coagulated, and the blood wasn't completely dry. "That morning I was in the square tidying up some flowers when I saw it. I called a couple who were in the rectory to come and see whether they saw the same as me. They confirmed it. Then I climbed up to the statue to check whether somebody could have taken it away and manipulated it. Since the statue is outside, it had accumulated some dust and also on the pedestal, so if someone had taken away the statue and replaced it, it would have been very difficult for him to place it on exactly the same clean spot, and without raising dust. It appeared to us that nobody had taken the statue away. So, if somebody had produced these tears, he had to do it outside with a ladder." But only when Father Costa took the statue to the rectory did he realize its unique features. "The blood flows to the outer corners of her eyes, and just on her eyelids there are two nodules. Since the Madonna has her eyes half closed, it is natural that the tears spread as they flow, forming these nodules." He asked a professional painter whether this effect could have been produced by somebody with a brush, or another tool. "Unless this person was an expert classical painter  like Velázquez and others who knew exactly where to paint tears and blood since they knew which veins it stems from, it wouldn't occur to him to paint these two nodules above the eyelids. The blood, as it spreads (and because of capillary action), is first drawn upwards, then absorbed, like a sponge, and then runs down the surface of the cheeks." Costa also checked with two doctors to see whether it would have been possible for somebody to inject blood into the two corners of the eyes and get the effect of pouring blood, since the statue is hollow. But they further confirmed that this was not possible, since the blood would have coagulated. 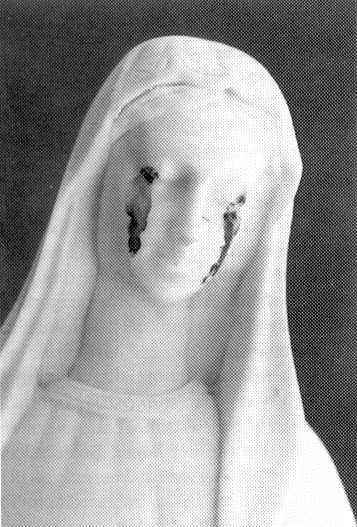 What is more, since blood does not adhere to this kind of marble and the Madonna's face leans slightly forwards, the blood would surely have fallen to the floor. "So I concluded," -- he pauses, measuring his words- "that the blood came out as in a natural injury, pouring downwards smoothly until it reached the lower part of the cheeks, where it formed two drops of blood. These two drops coagulated and then fell down, leaving a circular stain on each cheek that marks the existing drop and the coagulation, just like in a normal injury." These two circles, as well as the nodules above the eye, leave a vividly real impression that confirms to many the authenticity of the phenomenon. "Realizing there was 51 per cent possibility that this was a true miracle, I thought it my responsibility not to hide it, and to tell people what I and others have seen." Father Costa wrote a short report to inform his Bishopric but they paid his report no attention. Only when it was realized that the news had spread to the media, did the Bishop tell Costa to hand over the Madonna to the Bishopric, where it is being kept for three weeks under observation. "I haven't been told whether they will carry out tests or not." When asked whether he hoped the church would confirm the miracle, he added that although the Holy See had confirmed a [similar incident in Civitavecchia] partly because the Madonna cried in front of a bishop, he cannot say whether they will recognize the miracle even if they see it first hand. "The church mentality is that these phenomena are not possible, since this would imply that they should think in other parameters, more rational and intellectual, denying thus God's freedom to speak to us in this way. But many who have come here, and have seen the Madonna, do not doubt that this is true because they have seen it and feel it, and don't need further proof. And those approaching this in a critical frame of mind wouldn't believe it even if they saw all the miracles in the world. But one thing is certain: whether people believed or not, they stood in awe." Costa himself is well acquainted with miraculous events which he notices have been on the rise over the last 10 years. "I was never concerned with these kinds of phenomena till two years ago now, when I went though a series of events which cannot amount simply to coincidence- I finally had to accept that I was being somehow guided somewhere from above, especially when a series of books showing miracles came to me. I have been following the subject; I have been to Medjugorje, seen things and had personal experiences that leave me in no doubt that miracles exist, and even more, that there is a relationship between them. You know," he adds in a grave manner, quoting Father Pio from Italy, " 'When a mother cries, it is a bad thing.' And what does a mother do? When she sees something wrong, she first shouts, then she exhorts, and if she cannot solve the problem, then she cries. If the tears are of blood, it means the pain is deeper. These miracles are like a warning, a cry without words, to which people are free to listen or not." A cry for the present state of the world, our neglected earth and human relationships maybe? "Yes, for all of these, and more, possibly." Then he points to his readings of the works of various Catholics who have received messages from the Madonna, such as the Italian Father Gobbi, supported by the Pope, Father Pio, Sister Hanna, Mrs. Vassula and others, which apparently relate to many passages of the Bible, leading him to the conclusion that "miracles also announce future events to come, namely the appearance of the Antichrist in 1998 which will give way to the Second Coming of Jesus very shortly and the establishment of an age of peace, the Kingdom of Heaven on earth, rather than we going up to it. We will live in the Kingdom of Heaven. This is in the Gospel story." Although Father Costa has not registered any miraculous healing until now, since the miracle is very recent, he was amazed by the extensive media coverage that the subject has aroused, which he puts down to a genuine public interest, although he complains some media have manipulated his words, presenting him as an eccentric because of his interpretation of miracles. "Miracles are also indications of God of the way we should follow. Most priests believe that God spoke once and once only- 2,000 years ago, and that we just have to follow what is written in the Gospel story; but this is not true, not even the Gospel says this. The revelation has not ended, in times of urgent need, God speaks."